Trees and good electric service are both important to our community. NCU must trim trees for safety purposes, as required by law, and to avoid service interruptions. Many service outages and interruptions are caused by tree limbs that touch or fall into power lines causing damage to wires, short circuits and other problems. That creates potential danger for you and your property, danger that can be avoided by not planting tall-growing trees under or near electric wires, and by routine tree-trimming. NCU adheres to the American National Standards Institute (ANSI) A300, Standard Practices for Trees. This standard, endorsed by the International Society of Arboriculture, the National Arbor Day Foundation and the National Arborist Association, requires tree-trimmers to cut branches back to the “parent limb.” This practice allows the pruning cuts to “heal” more rapidly, reducing the chances of insect and disease damage, and promotes a healthier regrowth of branches that are directed away from the power lines. Pruning considerations include: species of tree, growth and regrowth rates, location of trees in proximity to power lines, voltage of power lines, type of power-line construction, length of pruning cycle, natural tree shape and branching pattern, general tree condition, appearance after pruning and tree-owner input. NCU uses the “natural trimming” method endorsed by the Tree Care Industry Association. It is called natural trimming because branches are pruned back to a natural point of growth in the crown of the tree. Natural trimming is healthier than tree “topping,” which is the indiscriminate cutting back of tree branches to reduce the size of the tree crown. Again, careful planting of trees and shrubs away from power lines can help eliminate the need for trimming in the future. For more information about tree planting, see our Tips For Home Tree Planning and Planting. Q: When will NCU trim or remove trees? Trees interfering with service wires (wires that run from NCU poles to the customer’s house or building) and yard light wires will generally not be trimmed. Arrangements can be made to have these wires temporarily removed to permit the property owner or a contractor to trim or remove the tree. If you want a service or yard light wire temporarily disconnected, please call NCU several days in advance to ensure the availability of a crew. This service is not available on Weekends or Holidays, and it may be delayed due to emergency work. If NCU requires that a tree be trimmed or removed, all branches and wood cut from the tree will be removed by NCU, except when other arrangements have been arranged with the property owner. The property owner may keep any portion of the wood desired, but NCU will not cut wood to uniform length or stack the wood. If trees require removal, they will be cut as close to ground level as possible. NCU will not remove stumps. Q: Is permission of the property owner necessary before doing tree work? A: Provision of right-of-way easements grant NCU the authority to trim trees without property-owner permission to provide for a safe and reliable electric system. However, NCU respects the property of its customer-owners and will try to notify the property owner of the need for tree work before trimming is done. In unusual or emergency situations, it may be necessary to trim trees without first notifying the property owner in order to restore service or eliminate safety hazards. Q: How does NCU know when a tree needs to be trimmed or removed? Reports of electrical outages caused by trees. Areas where trees have been damaged by storms. During the regular tree-trimming cycle and or tree growth approaching powerlines. Periodic inspections by NCU personnel. Reports from customers indicating potential tree/power-line problems. Q: What qualifications do NCU tree-trimming crews have? 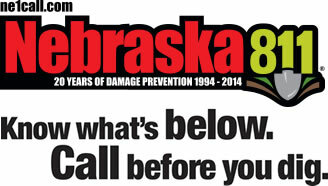 A: NCU employs a highly trained staff who have experience in forestry and are certified arborists with both the International Society of Arboriculture and the Nebraska Arborist Association. It is essential that tree trimming be done properly to ensure safe and dependable electric service, and to provide for the welfare of the trees on your property. Q: Can a private property owner or commercial tree-trimmer obtain help in trimming or removing trees near electric wires? A: NCU will assist property owners and/or their commercial contractors, at their request, with the trimming and removal of trees that are near NCU’s electric wires. The temporary rerouting, de-energizing or removal of electric wires that may be hazardous to workers. The trimming of the tree so that it can be safely removed or trimmed by the property owner or contractor. All wood will be left on the property owner’s premises. NCU is not responsible for cutting wood to size or piling brush. The customer or contractor will be responsible for removing brush that is blocking sidewalks or driveways. Q: Are wood and wood chips available to the public? Persons who want wood on private property must make arrangements with NCU. Tree crews cannot cut wood to uniform size or smaller than necessary for normal handling. Tree crews cannot load wood into private vehicles or trailers. Crews will not stack or separate wood. Wood and wood chips may be dumped on private or public property with approval of the property owner only when a savings in crew labor hours and equipment hours is evident. For more information about NCU’s tree-trimming practices, please call 402-873-3353.